What Does Code P0128 Mean? The thermostat allows the engine to come up to operating temperature quickly and then maintain a minimum temperature. Coolant from the engine flows through the radiator and air flow across the fins of the radiator. This air dissipates heat from the coolant before it returns to the engine. The water pump is belt driven off the engine. Just as the name implies, the water pump is designed to pump coolant throughout the engine. Cooling fans can be either of the mechanical or electrical variety. Most modern vehicles use electric fans. When the engine slightly exceeds the operating temperature (or when the A/C is switched on) the fans engage. The PCM sends the ECT a reference voltage. The sensor then varies the voltage according to engine temperature. The PCM monitors this change in voltage and using the information to control various system outputs. The cooling system employs different diameter hoses to connect the various system components. 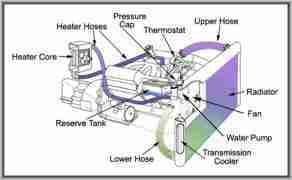 There are two main hoses – the upper and the lower – that connect the radiator to the rest of the system. The heater core is small radiator tucked away under the dash. Air passes over the heater core and into the engine compartment to keep it warm. What are the common causes of code P0128? What are the symptoms of code P0128? The description for code P0128 is “coolant thermostat (coolant temperature below thermostat regulating temperature).” This code is set when the PCM notices that the engine has not reached operating temperature within the specified time. In other words the engine is running too cold – or at least the PCM thinks it is. This code is designed to indicate a stuck open thermostat. How do you troubleshoot code P0128? Let’s start with easy stuff first. Wait until your radiator cap is cool to the touch, then remove the cap and check the level. Don’t rely on the reservoir level – check the radiator directly if possible. Check the condition of the coolant as well, looking for contamination or fluid that appears to be watered down. Coolant concentration can also be checked using a handheld hydrometer. If the coolant level is low, you will need to determine the source of the leak and repair it. A cooling fan that stays on when it’s not supposed to can lower the engine operating temperature. As was stated earlier, the fan should only run when the engine is slightly above engine operating temperature, or when the AC is turned on. In the case of an electric fan, open the hood and listen to determine if the fan is running when it shouldn’t be. If the fan is indeed running continuously, there is a problem in the circuit or the PCM is commanding it on when it shouldn’t be. If the vehicle is equipped with a mechanical fan, you won’t be able to audibly determine whether the fan is running. Mechanical fan clutches are designed to slip when cold and rotate when hot. This type of fan can be tested using an inferred thermometer and timing light. Start the engine and point the timing light at the fan to “freeze” the blades. Looking at the thermometer and fan rotation, you should see fan speed increase and decrease corresponding to engine temperature. If not, the fan is faulty and should be replaced. As was mentioned earlier, the PCM sends the ECT a reference voltage. 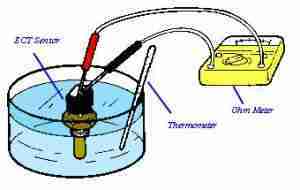 The ECT then varies its internal resistance according to coolant temperature. Most ECTs are of the negative coefficient variety. This means their internal resistance increases as coolant temperature decreases. One way to easily test the validity of the ECT reading is by using a scan tool and inferred thermometer. First, get the engine up to operating temperature and point the thermometer at the upper radiator hose. Next, view the coolant temperature on the scan tool and compare it to the reading from the thermometer. These two readings should be close to one another. If you have any question you can test the ECT and its circuit using a digital multimeter. Connect one meter lead to the signal and the other to ground. Set the meter to read ohms. The resistance reading should fluctuate according to temperature. Exact resistance specifications can be found in the manufacture’s service information. A stuck thermostat is the most common cause of a P0128 code. When the engine warms up, wax inside the thermostat expands pushing down on spring loaded valve. This causes the valve to open; flow to the bypass port is blocked and flow to the radiator is enabled. If the thermostat is stuck open – if it is partially sticking open – the engine will not reach operating temperature. Fortunately, the thermostat is easy to test. Allow the engine to warm up and then use an inferred thermometer to measure the temperature of both the upper and lower radiator hoses. If the thermostat is operating properly, the hoses should be about the same temperature. If not, the thermostat is faulty and should be replaced. P0128 code is closely related to P0125 “insufficient coolant temperature for closed loop fuel control.” The only difference is that P0125 indicates the engine has not reached sufficient temperature to enter closed loop (PCM feedback control of the onboard system). Unlike P0128, this code can be set by insufficient warm up times. For example, P0125 can be set if you live in a cold climate and only drive short trips. 2013 chevy cruze. getting code po1128 temp senors, while we have replaced the thermostat 3 times and the heat sensor 2 times were still getting code can anyone tell me what to look for next? i took to garage and they say that cant find a problem. I have a 2011 1.4 liter Chevy Cruze LT this morning I had a fault code P0128. So I changed the thermostat. After I was done I had a fault code. P0004. I cleared the code then drove the car for about 30 minutes. Didn’t get fault code again and 🤞. Does anyone know why I would get that code. Thanks for any help. I am getting the PO128 code and my car is not running hot. how long can I drive it before damage is caused. I have a 2007 Nissan Altima whit my service engine soon.it come up P0128 code what sure I do.tride to fixed my self.